While we have been getting regular updates from the shooting locales of 'OK Jaanu', the makers have finally fixed a date to release the film. As per reports, Dharma Productions' next starring Aditya Roy Kapur and Shraddha Kapoor is slated to release on 13th January, 2017. Directed by Shaad Ali, 'Ok Jaanu' is a remake of Mani Ratnam's super hit Tamil film 'OK Kanmani'. Karan Johar will present this film in association with Mani Ratnam. The dialogues and lyrics of 'Ok Jaanu' are written by the revered writer Gulzar. Music of the film will be composed by AR Rahman. Incidentally, Aditya and Shraddha are coming together for the second time after giving the successful on-screen love story 'Aashiqui 2'. Beautiful and stunning actress Amrita Rao shocked her fans on Sunday, when the news of her marriage got viral. She married her longtime boyfriend RJ Anmol in a private ceremony in Mumbai. The two were in a seven-year-long relationship before they finally got married on Sunday. This news came to light when, hubby Anmol wrote on his Facebook page saying, "An interview that started seven years back continues. Only to get stronger today! Just married! Myself and Amrita need your good wishes". 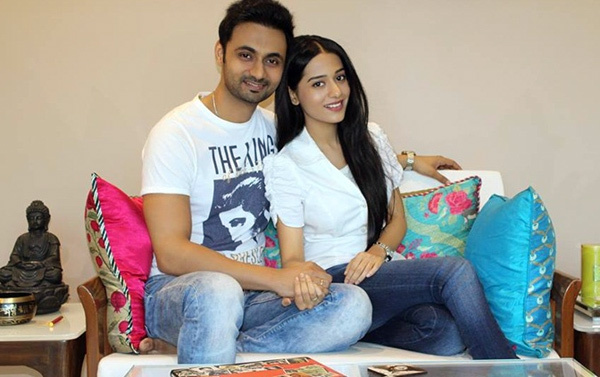 On that excited and happy Amrita Rao said, "It's been a seven year of blissful relationship & I'm the luckiest to find a soulmate in my life partner. We had a very small ceremony with our immediate family members only. Now I am back to shooting for 'Meri Awaaz Hi Pehchaan Hai'. I will be looking forward to spending more time now with Anmol whenever I get break from the shoot." Talented Amrita, is currently playing the character of Kalyani in &TV's popular show 'Meri Awaaz Hi Pehchaan Hai'. It is a powerful drama that traces the journey of the Gaekwad sisters. While, RJ Anmol hosts the show with retro Bollywood music called Purani Jeans on Radio Mirchi. We wish the much in love couple all the best for their happy married life! Aishwarya's Bold Purple Style Statement at Cannes: Thumbs-Up Or Thumps Down??? This year Aishwarya Rai Bachchan seems to have been in the mood of experiments. While she made an elegant entry at the Cannes Film Festival 2016 Red Carpet on first day, the diva went ahead to show her bold style. At the The Land Of The Moon premiere, Aishwarya no doubt was the enclosure of all eyes - with her flowing flowery Rami Kadi gown - but wait! She blew everyone's mind with her lipstick - which was PURPLE! While some may loved the bold attempt, others simply gave a clear thumbs-down to Aishwarya's purple lips. The actress easily became target of trolls for this as well. However, earlier Aishwarya took brownie points as she graced the premiere of Steven Spielberg's The BFG; looking like a classic Hollywood diva, wearing pink-gold Elie Saab gown. Aishwarya Rai Bachchan upped the ante with a gorgeous red gown from Naeem Khan's Resort 2016 collection on Day 2 of the festival. 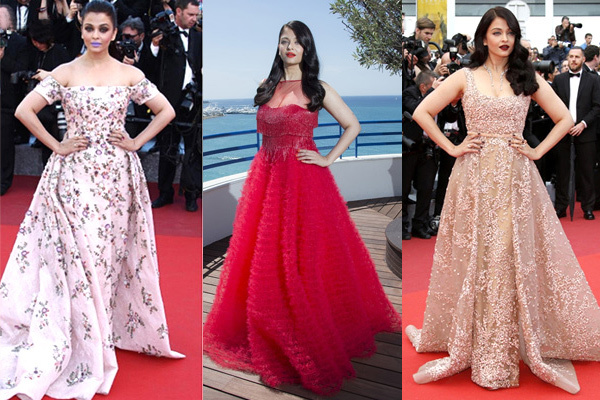 Aishwarya looks pleasant on eyes in this gown, with which she complemented with rose gold jewellery from Boucheron, Ferragamo shoes and a Pure Brick lip shade from the L’Oréal Paris Pure Reds collection. The 'Sarbjit' beauty turned up as a lovely doll in red on Day 2 - wearing red gown from Indian-American designer Naeem Khan.